Summary: He approached me in the street—bone-thin, gray-bearded, holding out a small envelope. “The man said you’d give me five bucks for it.” Inside was a one-word message: RUN. The main character in LONG WAY DOWN by Michael Sears is Jason Stafford, a former Wall Street trader who has spent 2 years in jail for insider trading and is now a financial investigator for a private investment bank. Stafford has survived the brutal murder of his wife and now has sole responsibility for his young autistic son. Stafford is assigned the job to investigate a high profile client, Philip Haley, who is accused of insider trading in his own company. Haley is adamant about his innocence and claims his computer has been hacked and he has been set up by his estranged wife or the Chinese, neither who wants to see his company reach a breakthrough in green-energy. Researching the guilt or innocence of his client puts Stafford and those dear to him in grave peril. Stafford’s investigation leads to an exciting chase that finds him facing corruption, death and threats on his life. The story concludes with an exciting struggle that ends in the East River outside New York City. At the same time there is a secondary story about Stafford’s relationship with his son. It’s a touching storyline that exposes the reader to some of the day-to-day trials of a parent dealing with autism. Author Michael Sears utilizes computer hacking as a primary part of his story, which is a quite popular theme in recent novels I have read. He also paints Wall Street as a corrupt institution where indiscretions are often overlooked, another popular theme. Sears’ characters are well developed and it’s easy to visualize them and form a quick opinion as to whether you like them. 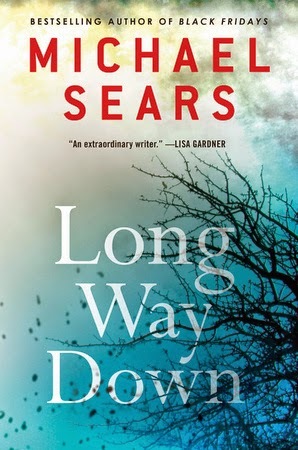 Sears takes the reader through a lot of twists and turns and keeps the reader guessing about the innocence or guilt of Philip Haley until the very end. The final struggle is quite ferocious, although a little far-fetched. LONG WAY DOWN is a respectable financial crime mystery that keeps the reader engaged until the very end. Thanks to Saichek Publicity for a review copy of this novel and thanks to Booking Pap Pap for writing such an insightful review. I do like thrillers especially when they keep me guessing. Another great review by Booking Pap Pap!